I was at my new favourite cafe the other day – it’s called The Rooster Coffee House and it’s fabulous. Well worth a trip to Riverdale if you’re in the general Toronto area. Anyhow, back on topic, I was sipping a soya milk latte with my mom and noticed in their stack of books the new Moosewood cookbook called Cooking for Health: more than 200 new vegetarian and vegan recipes for delicious and nutrient-rich dishes. Naturally I asked to borrow it. I posted their super yummy Pear and Thyme Vinaigrette the other day. 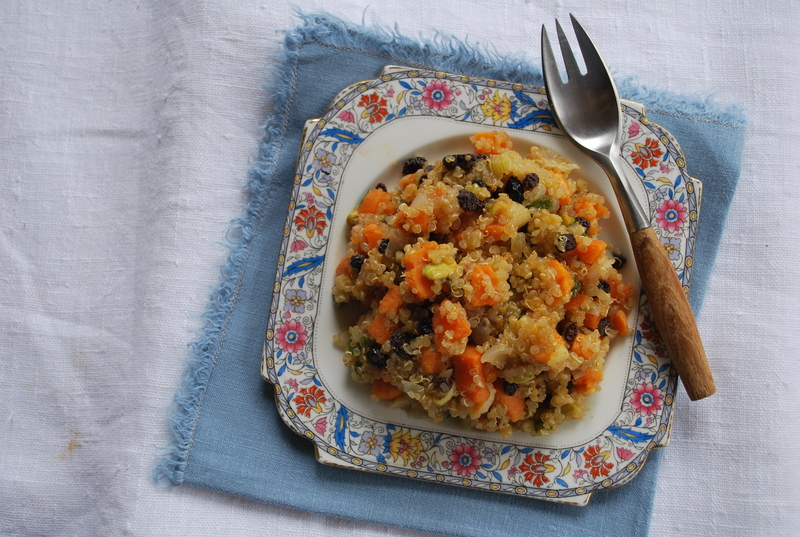 Today I’m posting a quinoa and sweet potato dish that is pleasing to the eye, taste-buds, nose, soul, and stomach. You gotta try it out. And I just had it for lunch so I can testify to the fact that it’s as good, if not better, the next day so make lots. 1. Rinse and drain the quinoa in a fine-meshed strainer to remove any residue of the grains’ bitter coating. 2. Warm the oil in a covered pan. Add the onions and salt and cook on low heat, stirring now and then, until the onions are transparent, about 8 minutes. Add the sweet potatoes, water, and drained quinoa, cover, and bring to a simmer. Lower the heat and simmer gently for 15 to 20 minutes, until the sweet potatoes are tender and the liquid has been absorbed. Remove from the heat. Stir well and add salt and pepper to taste. 3. Just before removing from the heat, stir in the greens, pine nuts, currants, green onions, and lemon juice. Let sit for 5 minutes. Season to taste with salt and pepper. 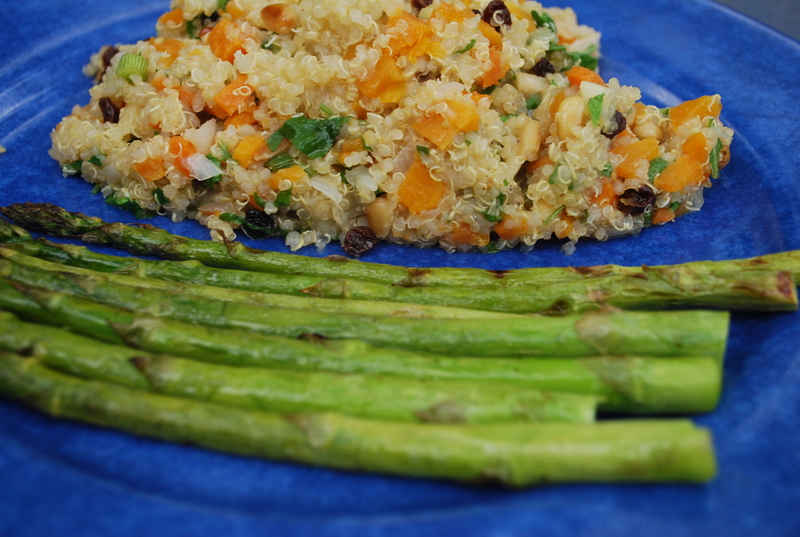 When Barb, Leah, Emily and I visited Machu Picchu in February our favouriote country side dishes were those made with quinoa, so we revisted our memories last night with this wonderful recipe of yours. It was sgreat!